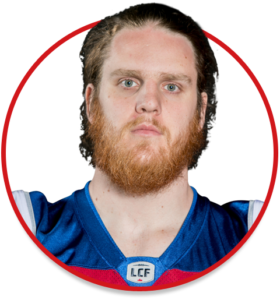 College: He completed his collegiate career with the Carleton University Ravens in 2017 after taking part in the Alouettes training camp. The centre was selected an U-Sports All-Canadian last fall. The 23-year-old aerospace engineering major helped strengthen the offensive line that helped running back Michael Arruda amass 1,110 rushing yards in only eight games, the second-highest count in the country. The line also allowed rookie quarterback Michael Arruda to pass for 2,146 yards and to become the second rookie in the school’s history to pass for more than 2,000 yards in one season. He hasn’t always been on the offensive line. He began in 2013 with the Carleton Ravens as a starter on the defensive line before his coaches asked him to switch it up. Graduated with a aerospace engineering major degree.